My flight from Sydney to Ayer’s Rock airport was at 10am, but after almost missing the flight due to the airport shuttle stopping at every hotel in the city, I was glad to make it. The flight was 3.5 hours, and I got some good views of the Outback, and of Uluru / Ayer’s Rock as I was landing. I was picked up by bus at the airport, (there were a total of 16 people on my trip) and we went immediately to the cultural center, which gave us a brief history of the area. Next we headed towards The Rock, with some stops for photos on the way. Once there, we did a few short strolls around parts of he base, which included some of the caves, and a permanent water hole. 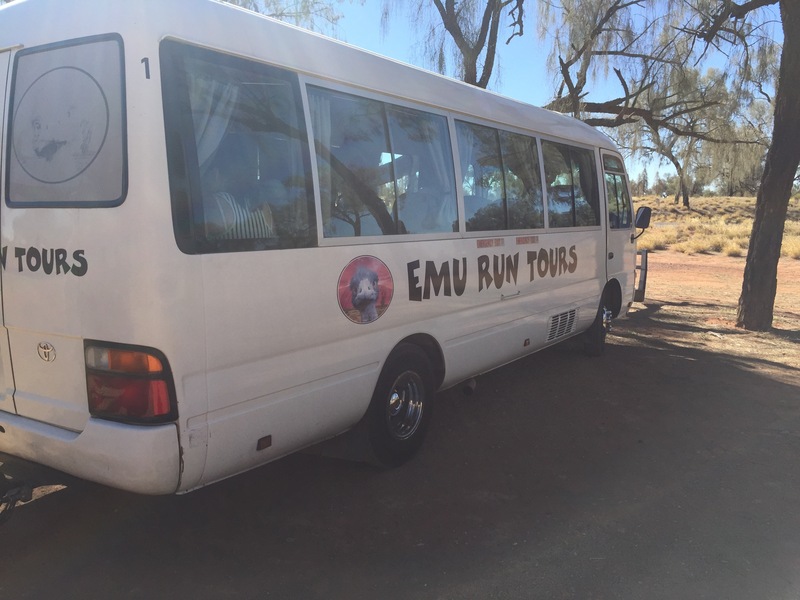 We also got some overviews of some of the ancient aboriginal traditions and practices, as they related to Uluru. 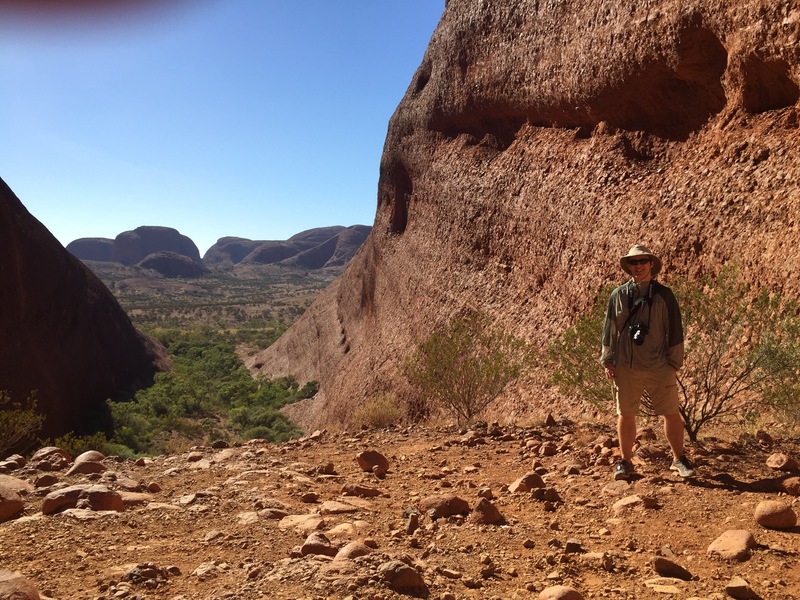 On our hikes, we were accompanied by a small army of flies, which followed us on every hike we did around Uluru and Tjuta. The tour advertised we could walk around the whole base, but that wasn’t actually the case, which was a bit disappointing. That said, considering it was about 95F with little to no shade, that might not have been a bad thing. We were also given the option to “hike” to the top (it had chains, but looked on par with hiking Stone Mountain). Had I known we weren’t walking the whole base, I probably would have done it, but I did not. 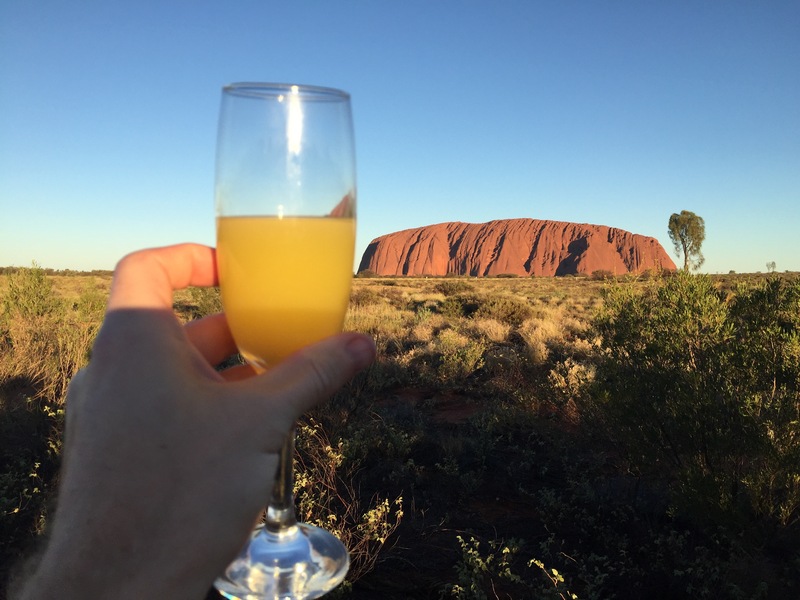 After our walks, we headed to a scenic overlook and watched the sun set on Uluru, while sipping on some champagne (along with every other bus load full of people in the park). We returned to our “camp” for the night (read – patch of dirt which probably didn’t have snakes that would kill us), set up our “swags” (no tents tonight), and got ready for dinner. The camps thankfully had hot showers, toilets, and sinks. We were treated to quite spectacular views of the night sky, with perfect views of the Milky Way. We were woken up at 5am to go see sunrise. 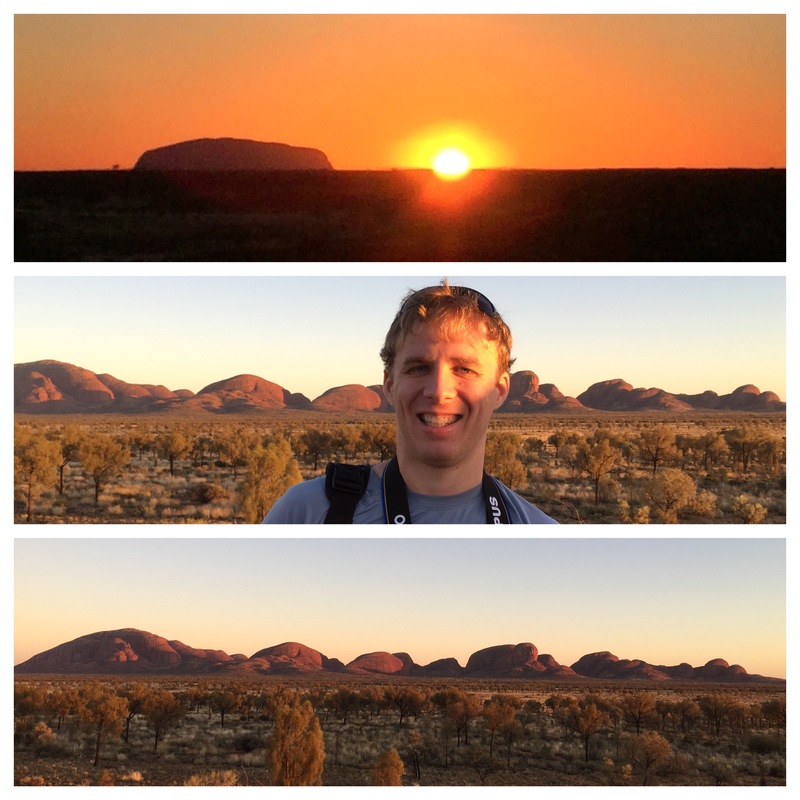 We drove to a lookout where we could see Uluru with the sun rising next to it, and could also see the light on Kata Tjuta (a group of 30 smaller rocky outcroppings). While there were a few people there, thankfully it wasn’t as crowded as sunset the previous night. 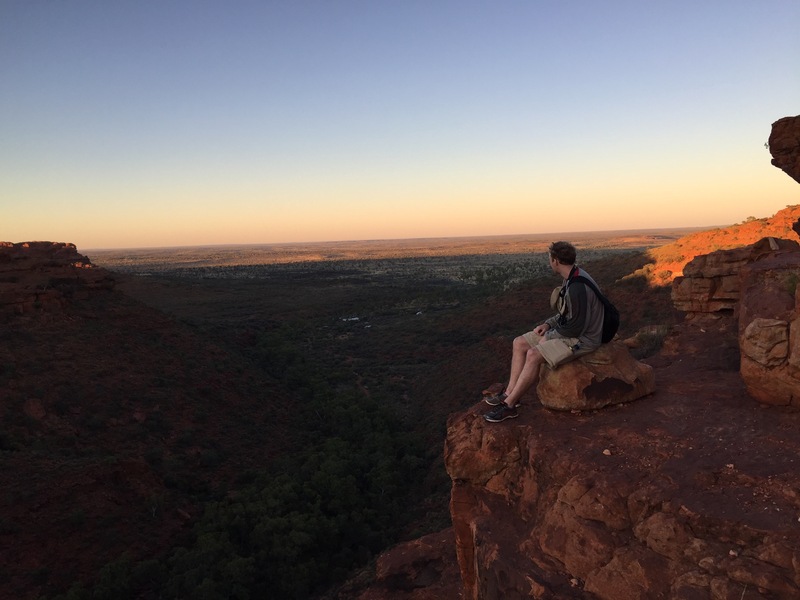 Once the sun was up, we headed for some specific rocks in Kata Tjuta, and a walk through some of the valleys called The Valley of the Winds. For some reason rather than doing the whole hike around one of these small rocks, we did an out and back hike. 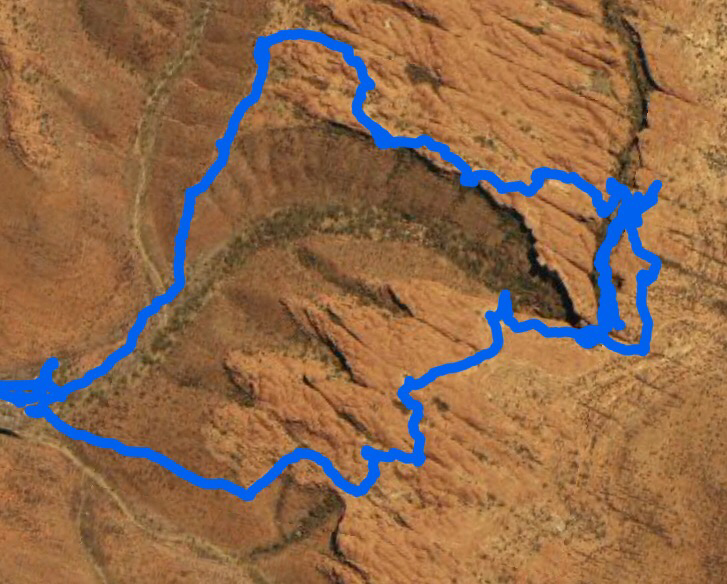 The hike was probably about 3km in length, all rocky, with a few scrambles. We had some good views of the rock faces, some of the valleys, and saw patches of vegetation using the rocks to survive out here in the desert. It was starting to get pretty warm as we finished, which meant it was time to head back to the camp for an early lunch (even though it felt like 3pm, it was only 11). Several burritos later, the camp was packed up and we got on the bus to head to Kings Creek Station for our next campground. The ride was about 3.5 hours, with a quick stop at a roadside gas station/shack, and random road stop for afternoon snacks. Our camp for the night was “luxury”, in that it actually had tents! 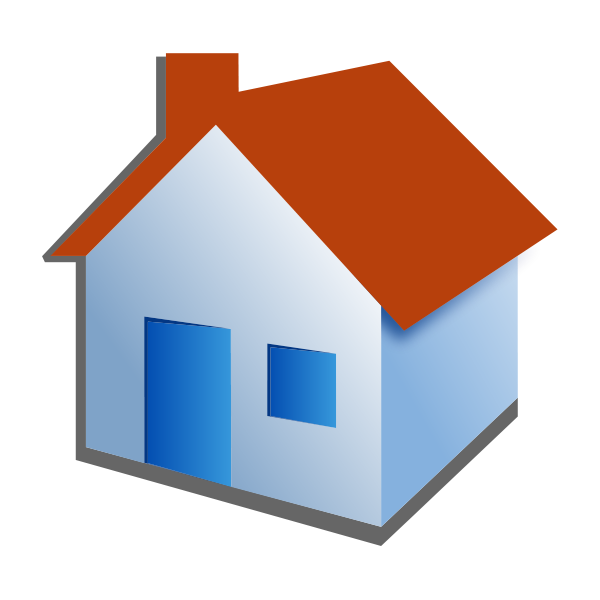 (As well as hot showers and toilets again). 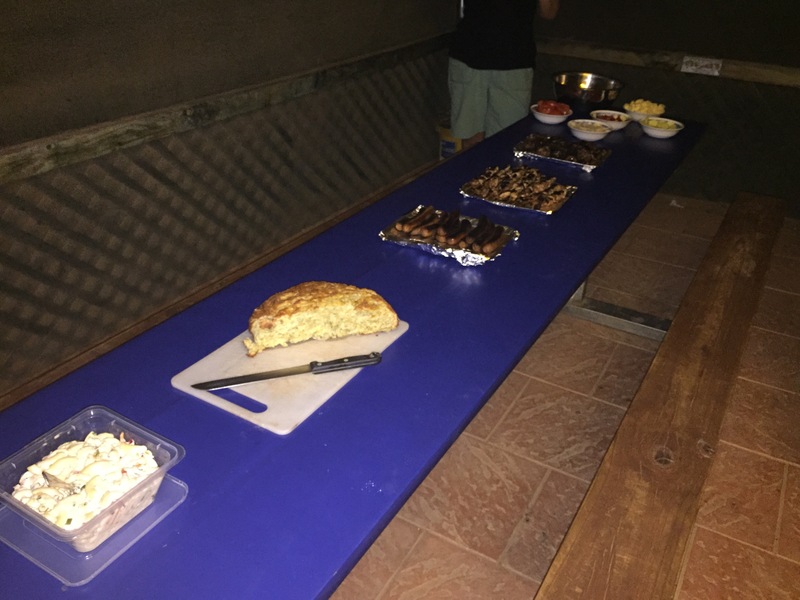 Once we had our swags set up, it was time for dinner. Along with chicken skewers and sausage, we had kangaroo steaks prepared with two different types of mairinate, which were both quite delicious. After looking at the stars for a bit again, it was time for bed as we had an early start planned the next day. Today we were woken up at 4:15am, as we had to be on the bus by 5am. 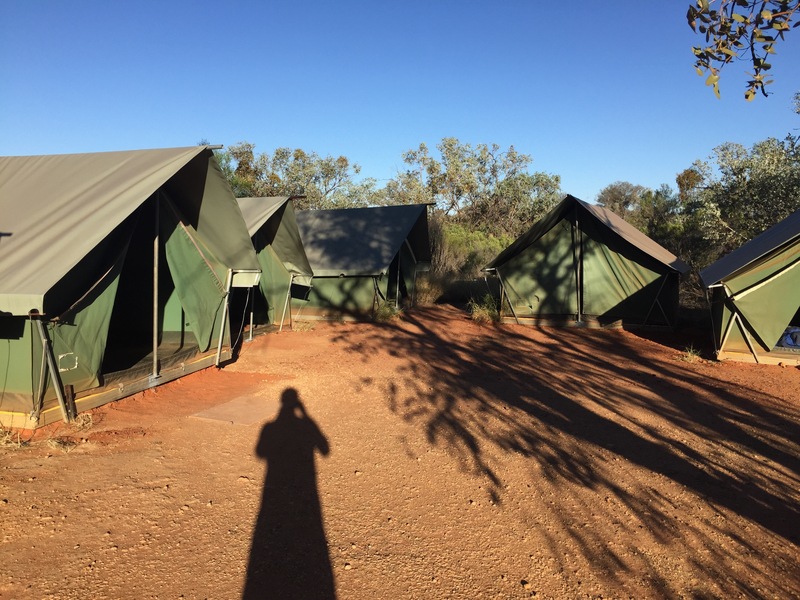 We were headed to Watarrka National Park, for a 6km Canyon Rim hike in Kings Canyon. We scrambled up about 500 stone steps, the first part of the hike, in the pitch black to get to a good lookout for sunrise. Once we had seen the sunrise, we set out to hike around the rest of the rim. The most interesting part of the remainder of the hike (besides continued great views) was called “The Garden of Eden”. 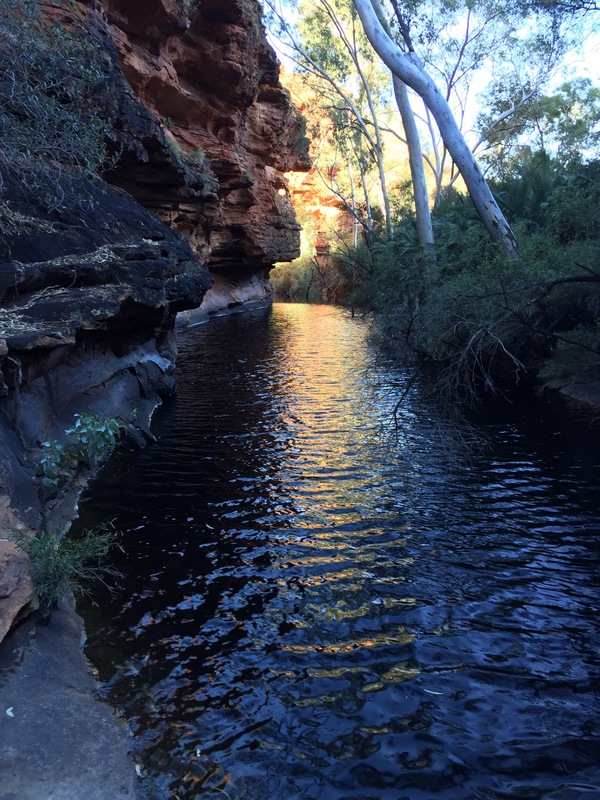 This was a permanent water hole tucked away in the Canyon with a lot of trees around it. Thankfully there was a decent amount of shade so we didn’t bake like we did the first day of hiking. We finished the hike up around 10am, which meant it was time to hop on the bus and head back to have lunch and pack up camp. Along the way home, we spotted a dingo running around in the bush. 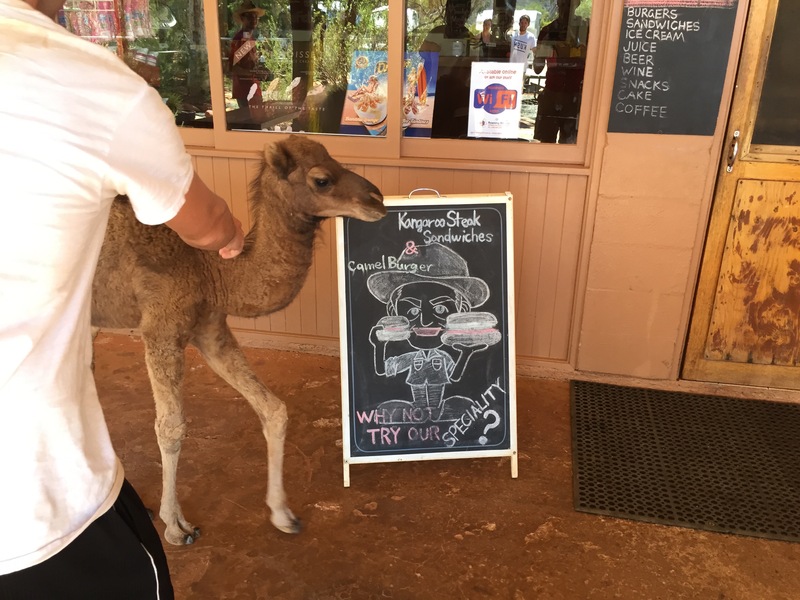 For lunch, we had camel burgers (if you hadn’t of told me it was camel, I would have thought it was a regular burger). 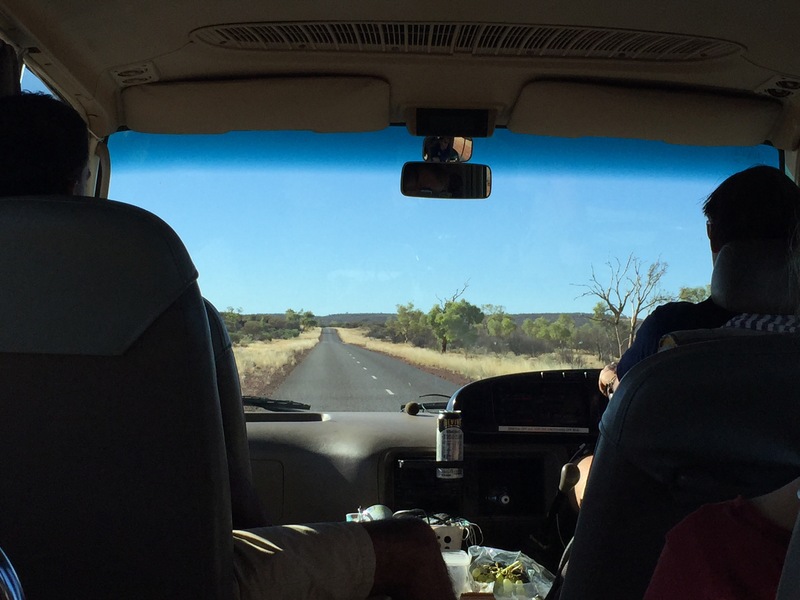 Then it was on the bus for 5 hour ride back to Alice Springs, and the end of our tour. 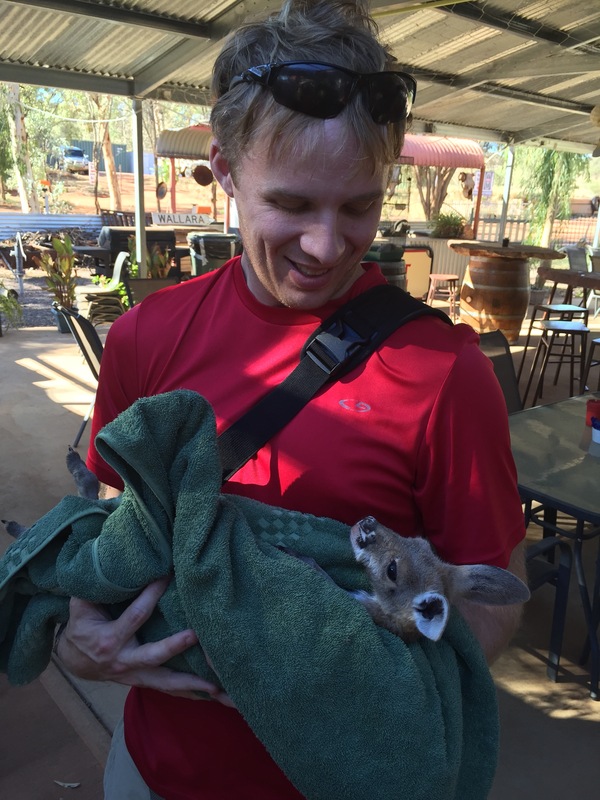 We had a brief pit stop, and the cafe had a baby kangaroo they were nursing back to health.